Premium quality cork-elastomer jointing, based predominantly on polychloroprene. Proven over many years in heavy electrical plant. 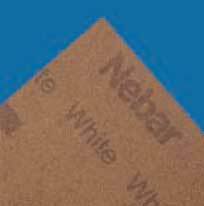 Previously designated Nebar® N6/25. • Top grade product for transformers and switchgear. • Developed for prolonged contact with mineral oils. • 105°C maximum operating temperature in liquids. • Retains flexibility down to –35°C. Thicknesses 0.75mm, 1.5mm, 2mm, 3mm, 4mm, 5mm, 6mm, 6.4mm, 8mm, 9.5mm.